Thanks to YOU, our members and supporters, PEDF has realized many successes over the years! To read John Childe's The Supreme Court Has Saved Our State Forests and Parks!, please click here. 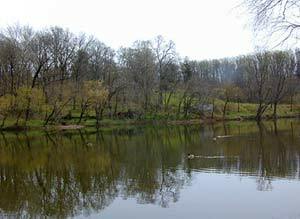 Babb Creek and Perkiomen Creek, photographed below, are just two more of PEDF's many success stories. now has a resurgent aquatic insect and fish population, including trout. Perkiomen Creek (Bucks and Montgomery Counties): PEDF focused on reducing pollution in the entire watershed. The Foundation took actions against municipal, commercial, industrial, and governmental polluters to mitigate numerous sources of pollution. The actions led to the designation of several sections of the Perkiomen Creek and its tributaries as high quality or exceptional value streams. Valley Creek (Chester and Montgomery Counties): PEDF initiated legal actions against two polluters who, consequently, eliminated their discharges. The Foundation also used a settlement from an action to fund documentation of PCB contamination in the stream. One result of PEDF's actions was the upgrading of the stream to exceptional value status. Red Clay Creek (Chester County): As a result of legal action taken by PEDF, a municipal authority agreed to alternative treatment of sewerage discharge. The water quality of the stream was improved significantly. Monocacy Creek (Northhampton County): PEDF action led to the elimination of pollution from a Naval Air station. Brodheads Creek (Monroe County): By challenging a permit application by a municipality, PEDF prevented doubling the sewerage discharge into this fabled trout stream. Upper Lehigh River (Luzerne and Monroe Counties): PEDF took action against the Turnpike Commission for an illegal discharge into the river. The penalty was used to fund a biological and water quality assessment of the river, funding for a township to fight degradation from a proposed development, and a donation to the Nature Conservancy to purchase acreage. Codorus Creek (York County): PEDF initiated action against an industrial discharge that resulted in mitigation of the pollution and a $17,000 award to the Codorus Creek Watershed Association. Big Spring Creek (Cumberland County): PEDF stimulated the Fish and Boat Commission to upgrade the treatment of the discharge from a hatchery operation. Clarks Creek (Dauphin County): PEDF was the first environmental organization in the state to take action against over-withdrawals of water from a stream. The Foundation's efforts resulted in an agreement with the Harrisburg Water Authority to guarantee sufficient in-stream flows to sustain the creek as an outstanding trout stream. Pine Creek (Tioga and Lycoming Counties): A PEDF action against a mining company resulted in the establishment of a trust fund. The fund has spent over $200,000 to mitigate large acid mine discharges into Babb Creek, a primary tributary of Pine Creek. Now the quality of the water in Pine Creek, below its confluence with Babb Creek, is better than it has been in many decades. 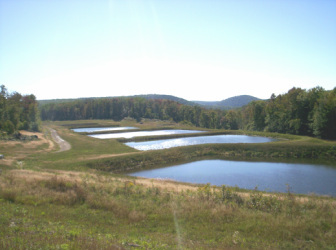 Spring Creek (Centre County): The Foundation instigated numerous actions against sewerage treatment facilities, a state prison, and the Fish and Boat Commission to mitigate a number of pollution sources. As part of the various settlements, $30,000 was awarded to a local Trout Unlimited chapter for habitat improvement. Logan Branch (Centre County): PEDF participated as the citizens' representative in an investigation of ground water pollution by an industrial firm. The result of the investigation was a settlement agreement that cleaned up the property and halted heavy metal pollution in the stream. Fishing Creek (Clinton County): As part of PEDF's agreement with the Fish and Boat Commission to clean hatchery discharges, the Commission installed an improved treatment system for the discharges from the Tylersville hatchery. Slate Run and Cedar Run (Tioga and Lycoming Counties): PEDF petitioned the Environmental Quality Board resulting in the classification of the streams as exceptional value. Sixteen Mile Run (Erie County): PEDF initiated legal action against a malfunctioning municipal sewerage treatment plant on the stream. Allegheny River (Warren County): A refining company was periodically discharging chemicals into the river. PEDF took the company to court at a significant cost to the Foundation and won a judgment against the company. Arnot Run (Allegheny National Forest): PEDF interceded with the U.S. Forest Service to prevent construction of a logging road in the headwaters of this stream. The agreement modified logging contracts to prevent erosion and sedimentation damage from road building. Chartiers Creek (Washington and Allegheny Counties): The Foundation has taken a number of actions against municipal and industrial polluters. Settlement moneys from the actions have been used to start a watershed association as well as to fund several studies of the stream and its problems.